My very first post on this blog was a "style & real estate" feature on a home my husband and I were totally smitten with in our beloved little neighborhood, Beacon Hill. For those who may not be familiar with Boston and it's numerous neighborhoods, our little corner of the city is filled with lots of federal style historic homes, gaslit lined brick streets and a charming main street USA where you feel like your in a small town versus a major city. The locals go all out for the holidays and walking through the streets during a snowstorm feels like you are walking in a snow globe of a make believe town. Basically what I am saying is that I love where I live and I couldn't imagine a better place to call home. So while we patiently wait to find our forever home in a impossibly difficult real estate market, I love to admire homes in our neighborhood that others have made renovated and made into urban paradises that any city dweller can be envious of. The home below of designer Nina Farmer is exactly that. 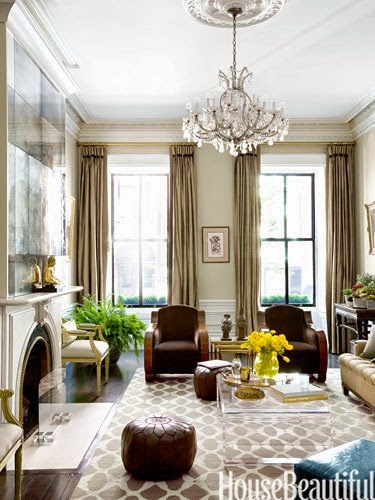 I am truly in awe of everything she did with her brownstone, check it out for yourself. 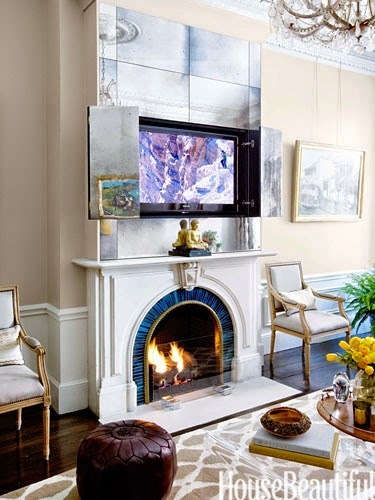 Disguising a television behind artwork is pure genius - stealing for my future home. This kitchen kills me with its perfection. How amazing is it's curved shape and floor to ceiling windows. Anyone recall the movie The Family Stone where the mom had her desk/office situation in the kitchen, I loved it there and I love it here...afterall, the kitchen is the heart of the home. 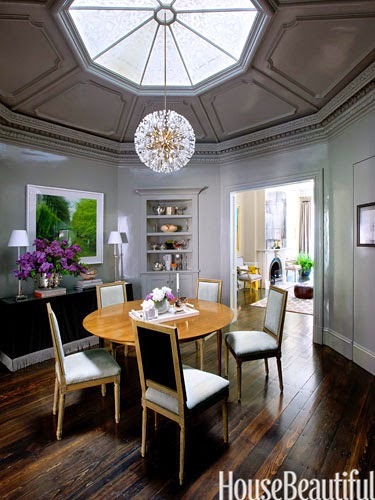 There are no words for the incredibleness that is the dining area below. Oh the fabulous dinner parties those walls have seen. 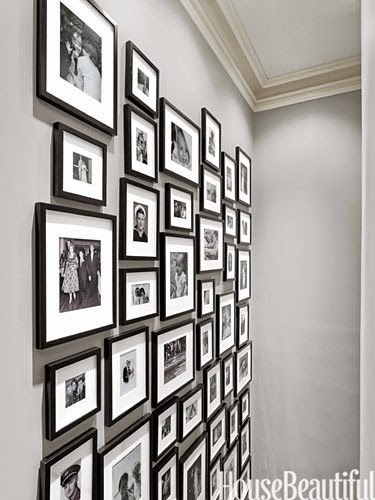 Note to self - make an all black & white gallery wall stat! So chic. 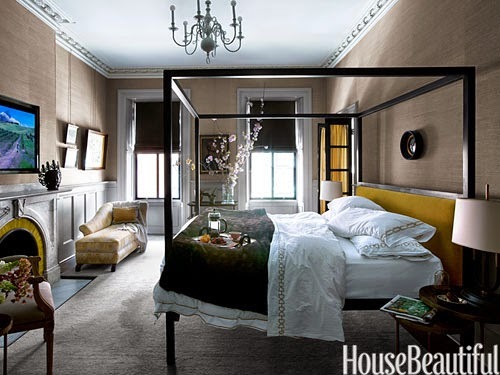 Who knew a chandelier & a four poster bed could work together? Is there anything better for a marriage then a double vanity in a bathroom? I think not. 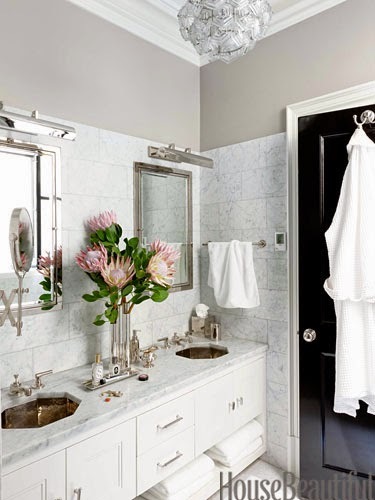 Also I will now want a giant arrangnment of fresh florals in my bathroom at all times. I love Beacon Hill too! :) It was so nice to meet you in the neighborhood the other day! 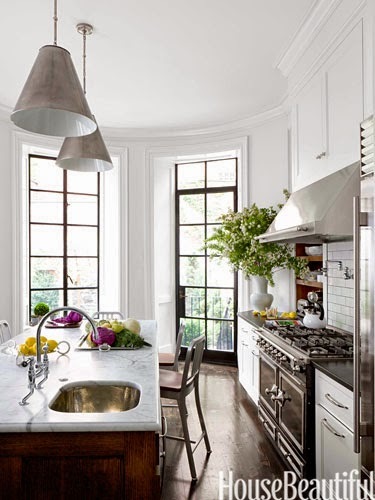 I love that kitchen - so beautiful. How amazing to have such huge windows!